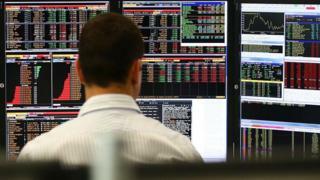 Investment group Old Mutual topped the London stock market in Wednesday trade, up by 2.8%. Rio Tinto was among the fallers, down 2.8% after it updated the market on its performance. It said profits had almost doubled to $3.3bn for the six months to 30 June. The benchmark FTSE 100 ended the day down 0.16% at 7,411.43. In the FTSE 250, shares in William Hill bookmaker rose 6.1%, despite an 11% drop in first-half pre-tax profit. The firm, which named a new chief executive and a finance chief in March, said profit before interest and tax for the 26 weeks to 27 June fell to £109m from £122m a year earlier. Other big winners in the FTSE 100 included ITV, Paddy Power Betfair, Kingfisher and Babcock International. Other big fallers included Standard Chartered, Rolls-Royce, Micro Focus International and BAE Systems. On the currency markets, the pound was up 0.2% against the dollar at $1.3230 and 0.3% down against the euro at 1.1156 euros.